I remember my first visit to Nobu, in New York City, a long time ago. The restaurant was buzzing. The miso cod was better than I imagined it could be, especially after reading about the dish for so long. The table next to me was a film crew from Tokyo making a commercial for Dunkin Doughnuts Japan and we started chatting. I got a side job for the next two days as an assistant for the crew. It was all so exciting, the great food, making new Japanese friends, and the energy that comes from a busy restaurant. Nobu restaurants appeal to a large audience and for good reason. Nobu Tokyo is located just next to the Okura Hotel. Walking in I felt like I was back in Manhattan. Many of the staff speak English, the restaurant floor is quite big, especially for Tokyo, and there were a lot of non-Japanese diners. The restaurant was quite busy at 12:30 on a weekday in early April. I came to meet a girlfriend who works nearby and she often comes here for lunch. The lunch menu is big, there is something for everyone, and there is even an English menu. 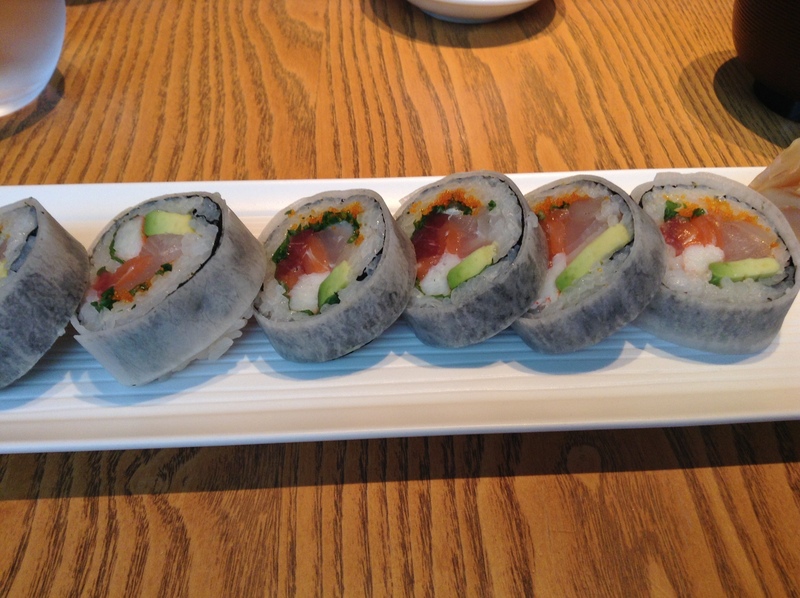 I ordered the Nobu house special roll and handmade soba combination lunch (2,400 JPY). I had the pleasure of helping to translate Nobu: The Sushi Cookbook from Japanese to English. Many of the recipes are now a part of our repertoire, like pressed sushi and miso soup with fresh tomatoes. Even the miso cod, a traditional Japanese dish, is something we often make at home. I finally had the chance to try his signature roll, which is covered with a thin sheet of daikon, adding a crispy crunch to norimaki roll. The stuffings included creamy avocado, crunchy tobiko (flying fish roe), and sashimi. I absolutely loved this addition of the daikon, which is Nobu’s creation. Nobu is brilliant in my mind and this just confirmed that for me. 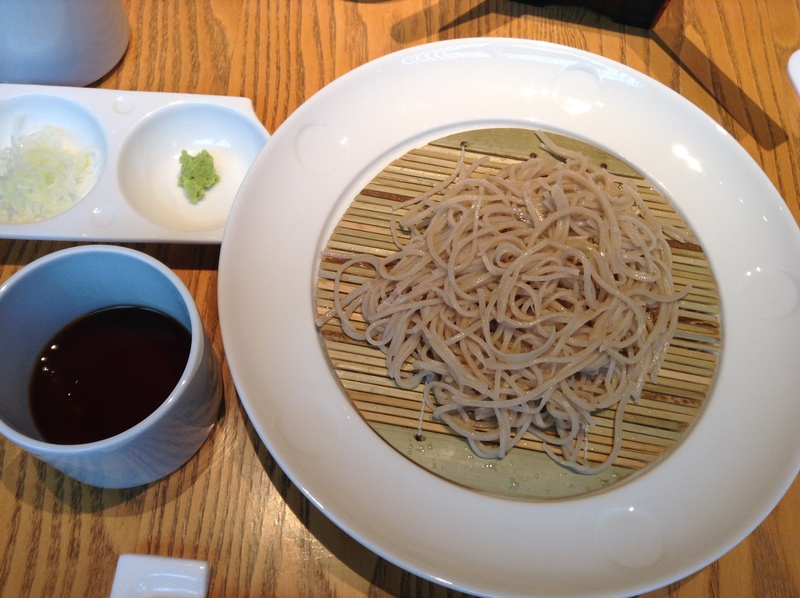 The soba is served cold with a dipping sauce. Towards the end of the meal the kitchen sends out some soba-yu, the hot water that the soba is made with. That is poured into the dipping sauce and then drunk. The table next to me was having the lunch box with miso soup (3,400 JPY) that looked nice and included a variety of hot dishes and sushi. I was curious to try the Stone Oven Vegetable Plate. The Japanese menu said kisetsu yasai, or seasonal vegetables. I asked my server what the seasonal vegetables were for this dish as it is spring and many of my favorite vegetables are in season. But his reply was standard vegetables like broccoli, carrots, and bell peppers. Glad I went with his signature roll which was a revelation. I had a hard time finding the restaurant as signage is minimal. Lunch at Nobu is not cheap. If you have not experienced a meal at Nobu, it is nice to have once in your life. His cuisine and influence has brought Japanese food to the masses.